Sadly I can’t take credit for these chocolate chip beauties. They are Toll House’s original cookie recipe. 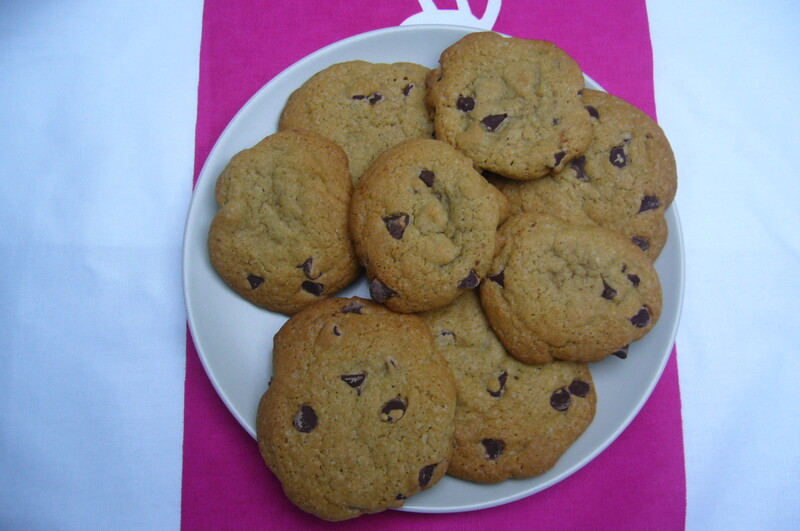 They are soft and chewy in the middle with crisp edges, the perfect cookie. However, I did grow up making and eating them and I wanted to share them with you. It’s foolproof. Pre-heat the oven to 180°. Cream together the butter and sugars. Beat in the eggs, one at a time, and add the vanilla. Add the sifted dry ingredients and mix well until thoroughly combined. Mix in the chocolate chips. Drop teaspoonfuls of the batter onto greaseproof paper, spaced well apart. Pat them down a little if you like. Bake in the centre of the oven for around 10 min or until golden brown. Let them cool on the baking sheet for couple of minutes before moving them to wire racks to cool completely. Eat a few while they’re still warm – mmm, yummy! So, this is my first post. I think this blog will turn out to be a place for me to show and tell my foodie adventures, exploits and experiments. 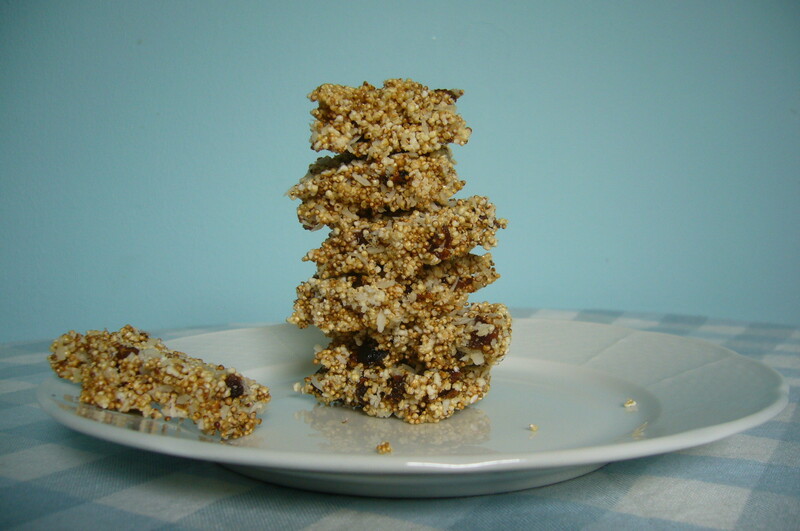 First up, amaranth snack bars. I have wanted to make these ever since I was handed a bag of amaranth with the words “I don’t know what to do with this – you play with it and make something”. I was pleased that it actually came out pretty good. These are crunchy, chewy, sweet and light all at the same time. And super-healthy, to boot. They taste much naughtier than they are. A perfect snack. The reason I’ve called them shapes, rather than squares, is because it turned out to be rather difficult to cut neatly. Perhaps I should be more patient next time and cut it when it’s a bit cooler. The most difficult bit is popping the amaranth seeds. This works the same way as popcorn, but because the seeds are so teenytiny, it’s much easier to burn them. Heat a pan (with a lid that fits), and drop in a few test seeds. When they start to pop, add 1 tbsp of seeds. Put the lid on, and shake the pan over the heat for around a minute (but use your judgement – it depends on how hot the pan is, how many seeds are in there etc). Be careful, they burn quickly! 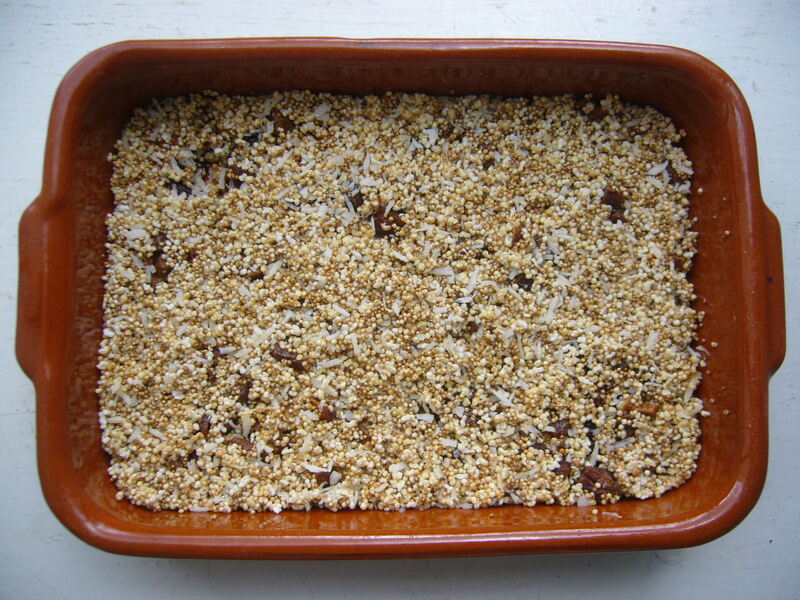 When it sounds like most of the seeds have popped, pour them out into a bowl and repeat with another 1 tbsp of seeds. By popping them in small batches they pop better and it’s easier to prevent them burning. Heat the honey a little until it is warm and runny, and mix in the popped amaranth well. Stir in the coconut and apricots. Pat down well into an ovenproof dish and bake on a slow heat (about 120C) for around half an hour, or until lightly browned and smelling toasty delish. When almost cool, cut into squares or triangles or whatever shape takes your fancy. Or just break it up into higgledy-piggledies.